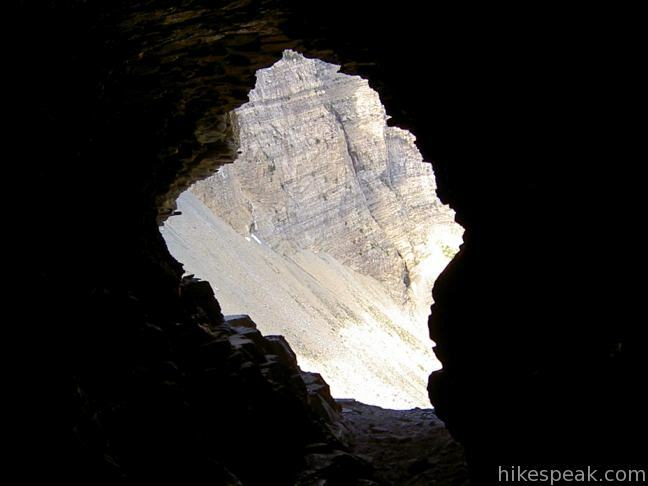 Crypt Lake Trail is consistently ranked as one of the top hiking trails in the Canada Rockies. 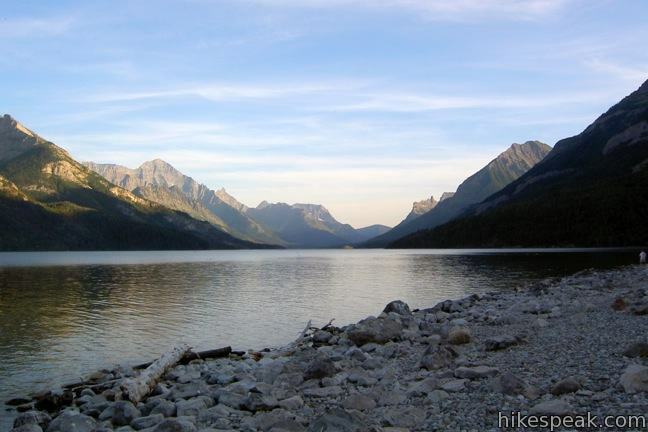 To reach the trailhead, you must first take a 15-minute ferry across Upper Waterton Lake. 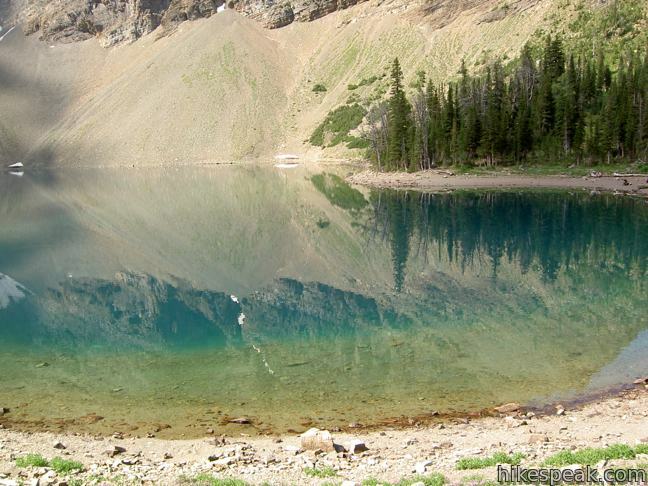 From there it is a 10.8-mile round trip hike to a sparkling turquoise lake cradled by horseshoe-shaped cliffs. You’ll gain 2,300 feet along the way, passing waterfalls, crawling through a tunnel, and clinging to chains bolted along a narrow ledge. 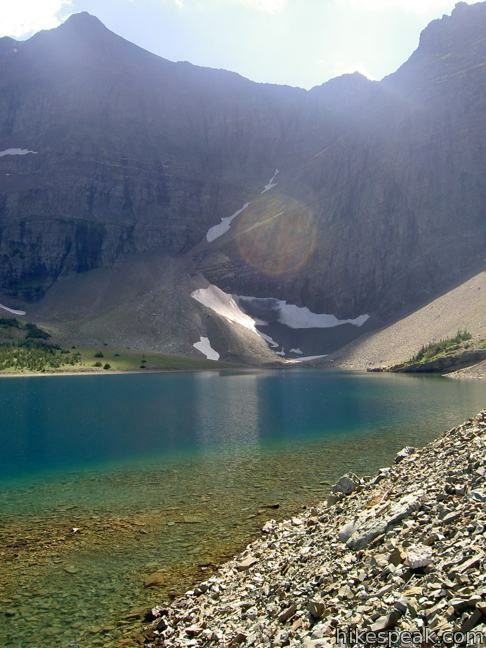 At the end of the trail, you can even set foot in another country, the good old U. S. of A. Crypt Lake Trail is an exciting hike to a stunning location – Rocky Mountain perfection! 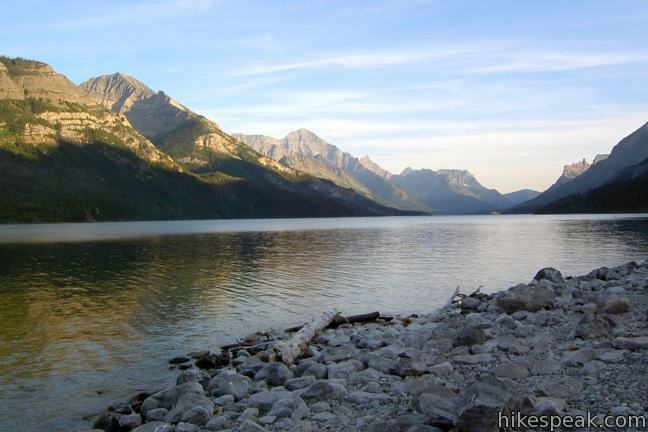 Canada established Waterton Lakes National Park in 1895, 23 years after the world’s first national park was created in the United States about 300 miles to the south (going by the name of Yellowstone). 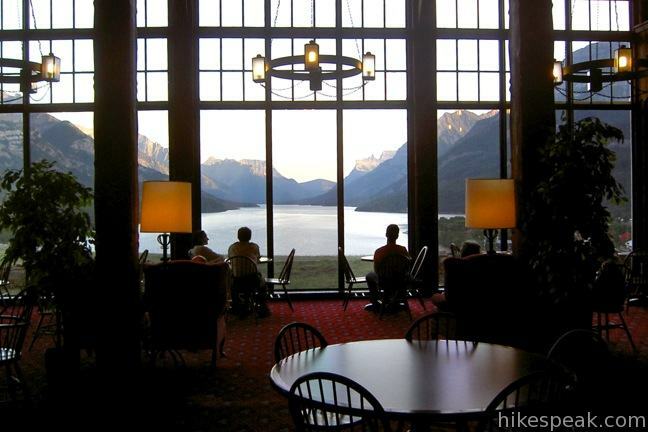 In 1910, Glacier National Park popped up in Montana just over the border from Waterton Lakes. In the tumultuous year of 1932, the North American neighbor nations linked the two parks to create the world’s first international peace park. 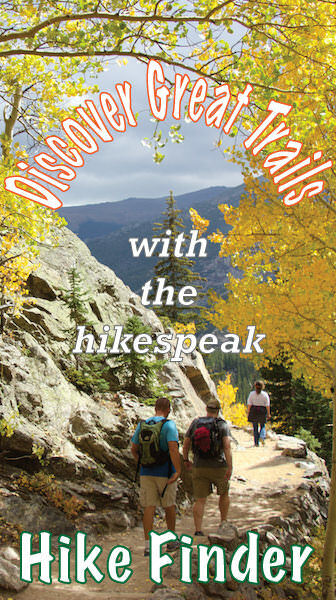 It is in this spirit of international friendship that hikespeak.com makes its first trip outside the United States for a hike up Crypt Lake Trail. The acclaimed trail could not be a worthier candidate for the milestone. 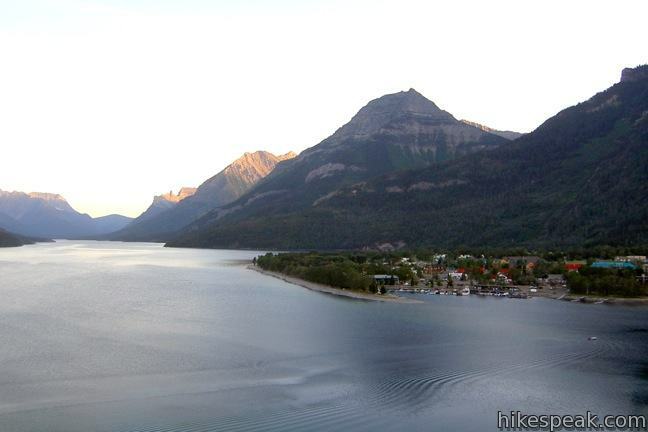 Start from Waterton Township on the northwest end of Upper Waterton Lake and find the boat launch at the marina for the Waterton Shoreline Cruise Company. Tickets for the Crypt Lake Shuttle Ferry are $20 for adults and $10 for children (as of 2012). Ferries leave at 9:00 a.m. and 10:00 a.m. daily. On the ride to Crypt Landing on the east side of the lake, enjoy fantastic views south toward the United States, and north toward the historic Prince of Whales Hotel situated on a bluff above the lake. There is no drinking water on the boat or along the trail, so pack everything you need before you start. 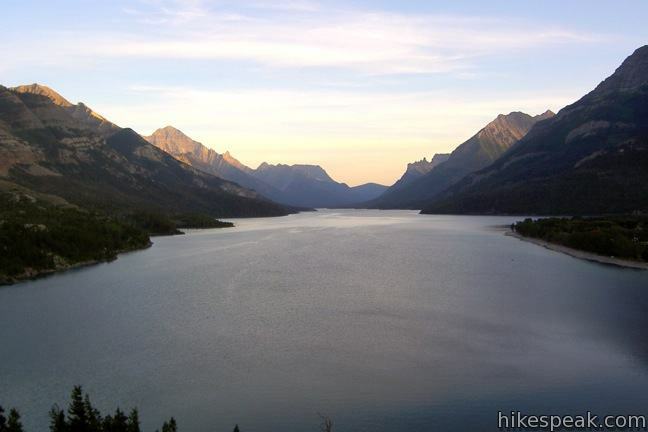 Ferries return to Waterton Township at 4:00 p.m. and 5:30 p.m. If you are an agile hiker and would like a bit more solitude along the trail, try to get to the front of the pack leaving the ferry. 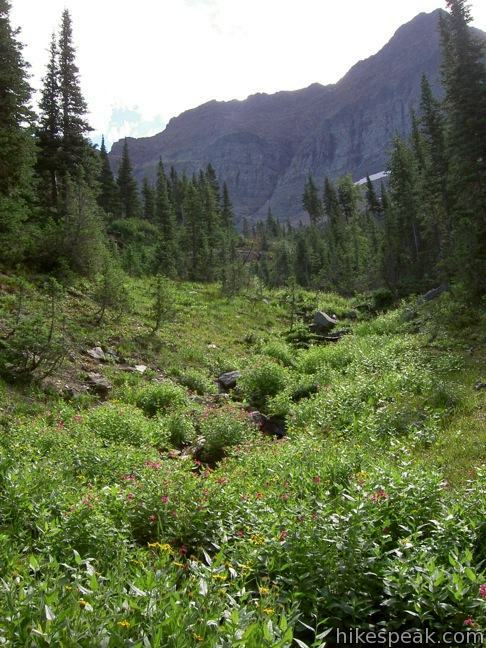 Otherwise, you’ll find yourself trapped by slower hikers moving up a single-track trail that rarely offers a passing lane. 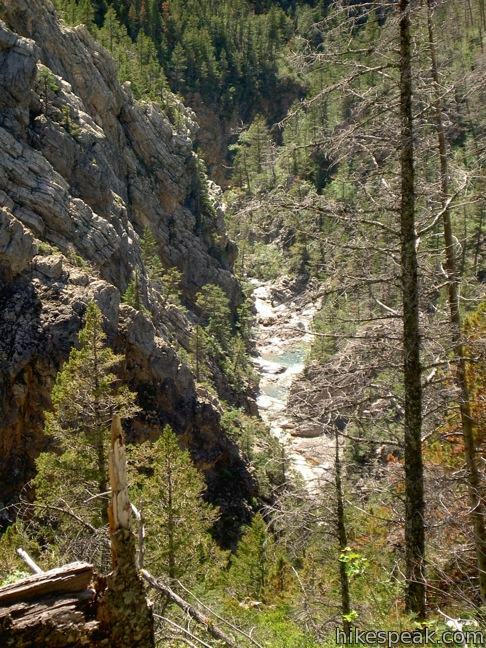 There are just two noteworthy junctions along the trail, both with Hell-Roaring Falls Trail. This trail can be used to add a small loop to the start of the hike. 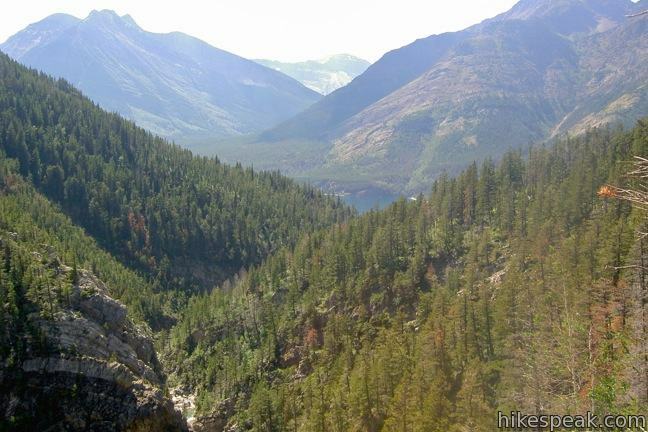 The side trail provides glimpses into a canyon carved by a cascading creek, while offering excellent views over Upper Waterton Lake. The first junction with Hell-Roaring Falls Trail comes a quarter mile from the start, breaking off to the right. The second comes at 1.85 miles from Crypt Landing when the trails reunite. 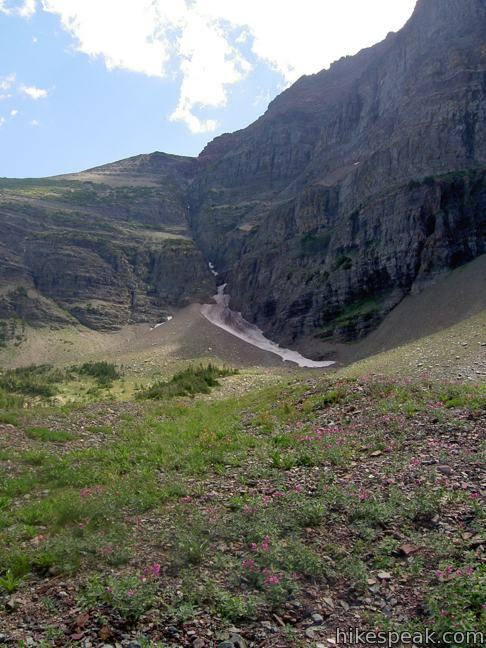 Hell-Roaring Falls Trail is steeper than Crypt Lake Trail, so it is preferable to save this route for the descent. Crypt Lake Trail leaves the landing beneath a lush canopy of spruces and firs. As you make your way up a mile and a half of switchbacks, the forest thins and the shade disappears. You’ll cross an exposed mountainside on the north side of Crypt Valley. 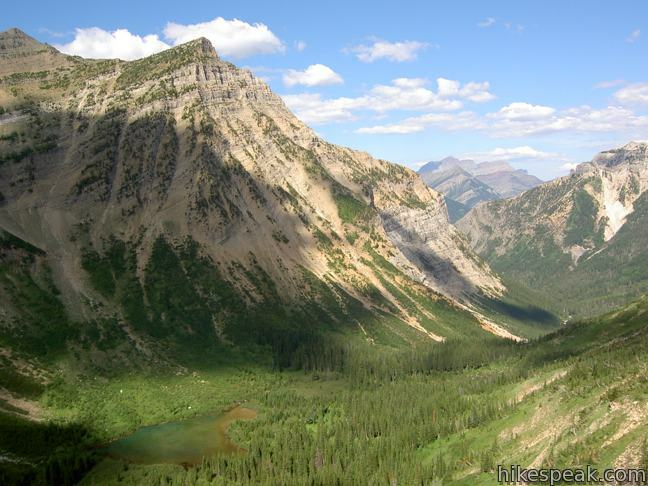 Mount Boswell rises like a citadel to the south, capping off an impressive valley view. Pass Twin Falls just over two miles from the start and continue to another lovely waterfall, Burnt Rock Falls, which dangles off the end of short ledge. 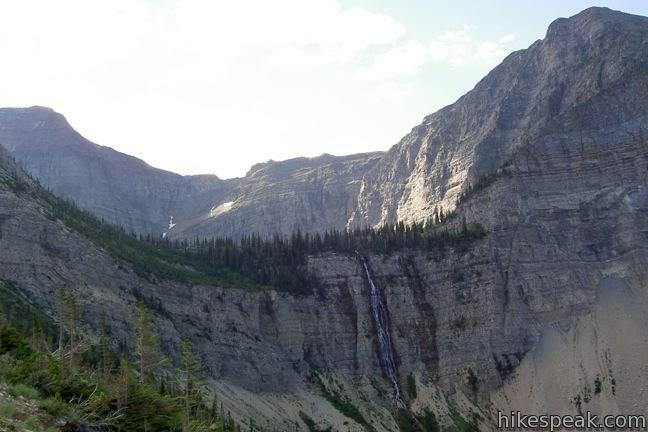 The biggest and best waterfall lies ahead, but to get there requires interesting maneuvering. 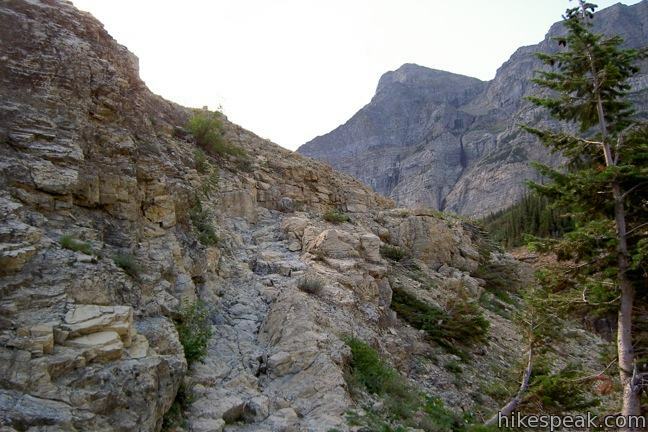 After Burnt Rock Falls, the trail becomes a bit more challenging, climbing higher up the side of the valley. 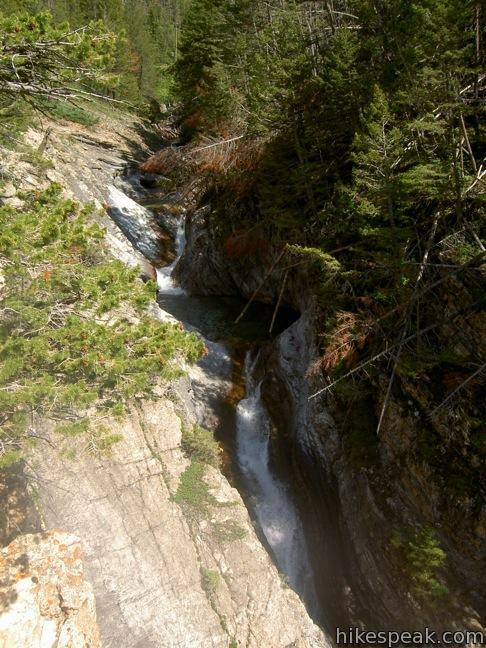 you will be treated to a view of Crypt Falls, a 600-foot streak coursing down a long rock wall. 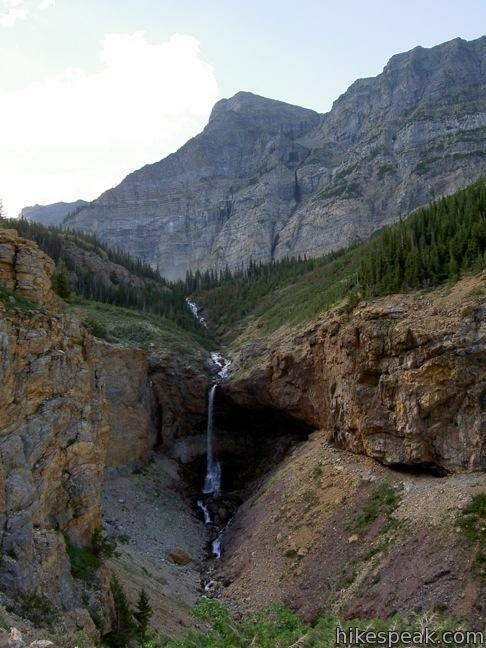 Above the waterfall is the hanging valley that houses Crypt Lake. 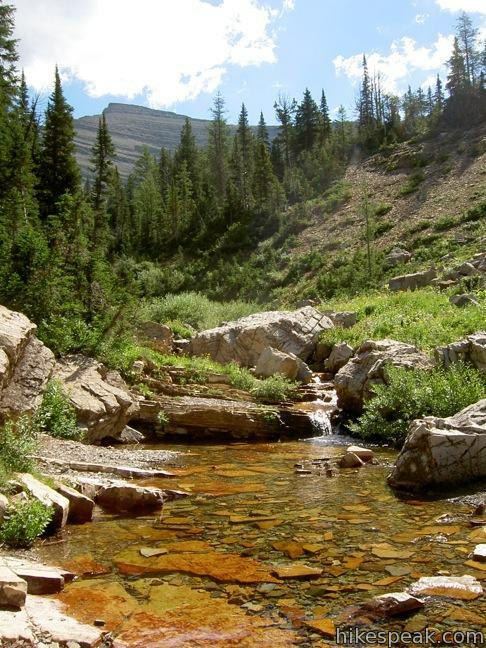 It is a beautiful sight, but on this hike, things only get more amazing the farther you go. 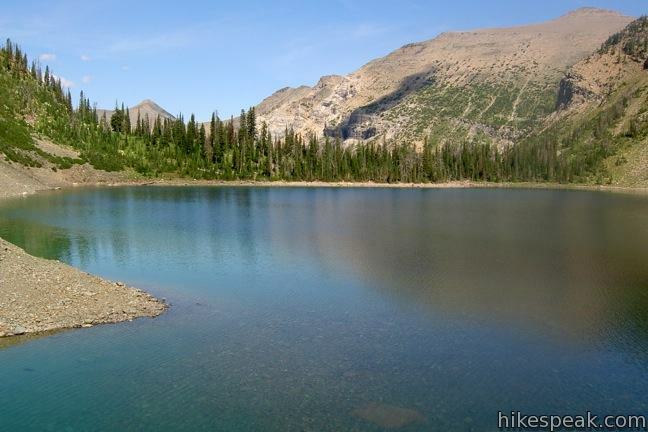 At 4.5 miles from the start, the trail passes Crypt Lake Campground, a former backpackers retreat that is no longer in operation. Continue half a mile past the campground on what seems like a dead end course toward a sheer cliff. This is the start of the unique and exciting ledge and tunnel section of the hike. Step up an 8-foot metal ladder and into a fortuitous natural tunnel. Crawl, squat, or waddle about 80 feet through the misshapen tube to reach the next challenge, a cable traverse. 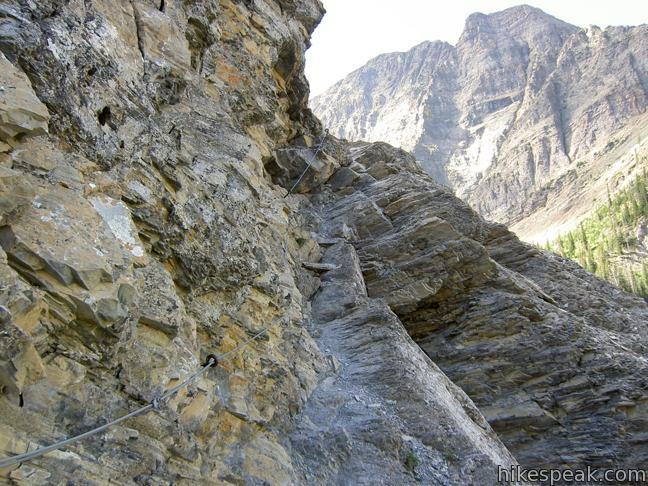 Hike up a narrow jagged ledge with a good grip on the steel cable bolted to the rock face. 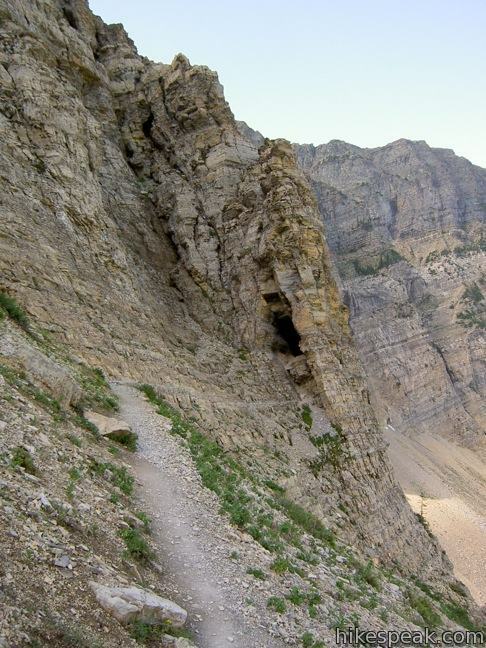 The going may appear precarious, but the trail is reassuringly safe while providing a welcome adrenaline rush for those not afraid of heights. A quarter mile past the chains, the trail passes near the top of Crypt Falls. Take a path off the main trail to look over the brink of the falls. Above the waterfall, the creek pours like magic from a gap in the rocks. 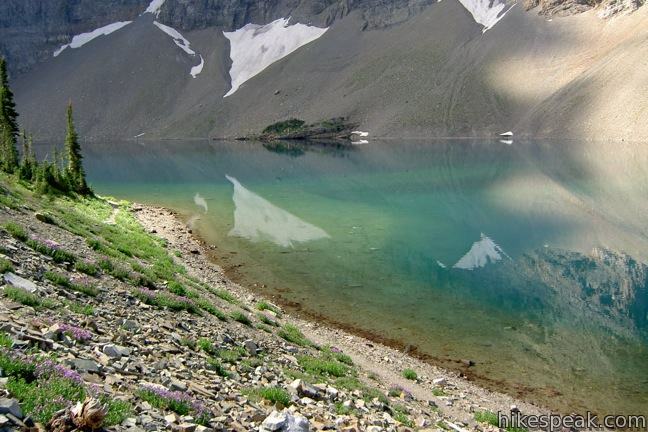 In truth, the water is seeping through the ground from Crypt Lake, about a tenth of a mile farther up the trail, cradled in an alpine cirque at an elevation of 6,380 feet. Crypt Lake is breathtaking. Even if your legs weren’t tired, the beauty would likely stop you in your tracks. The water glistens in a rainbow of colors ranging from emerald green to dark blue and indigo. Purple-tinted gravel scree surrounds the ovular lake adding even more color. 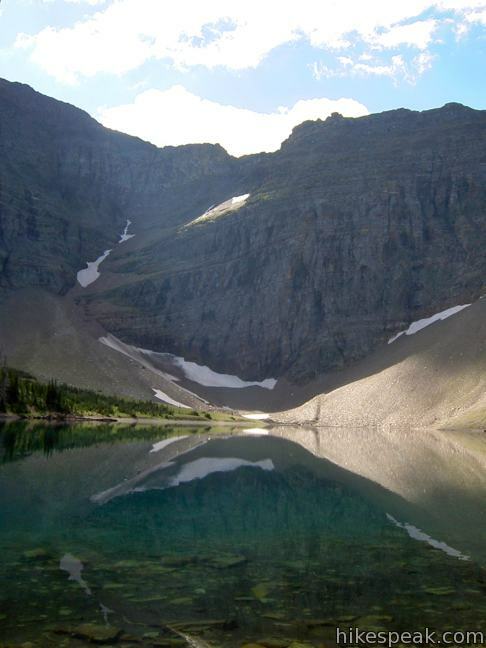 Thousand-foot cliffs tower over the lake, leaving a reflection on its mirror-like surface. 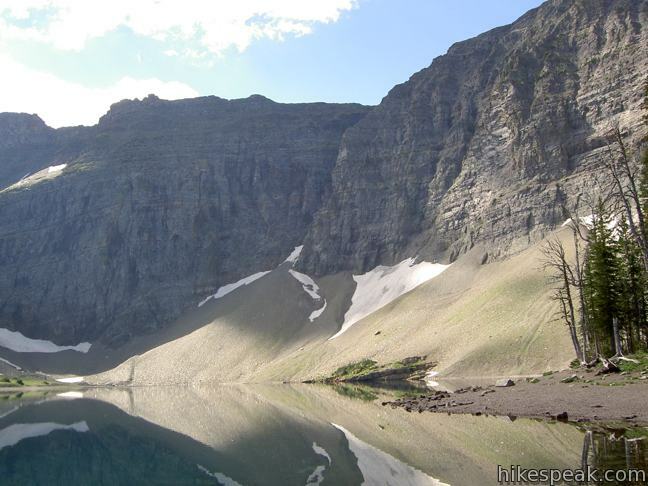 The imposing wall south of the lake actually lies across the border in the United States. No border patrol is necessary at Crypt Lake though, since only a very skilled climber could get more than a few feet into the US. 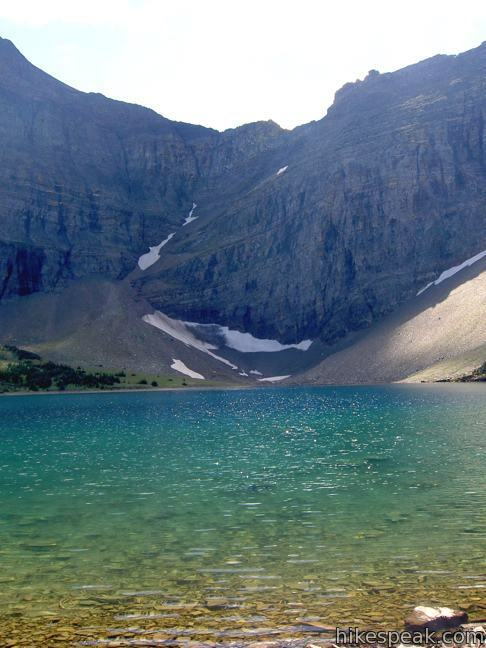 In late summer, if the ice shelves around the lake have melted, hike down to the south end of the lake to make a brief quixotic entry into the United States. 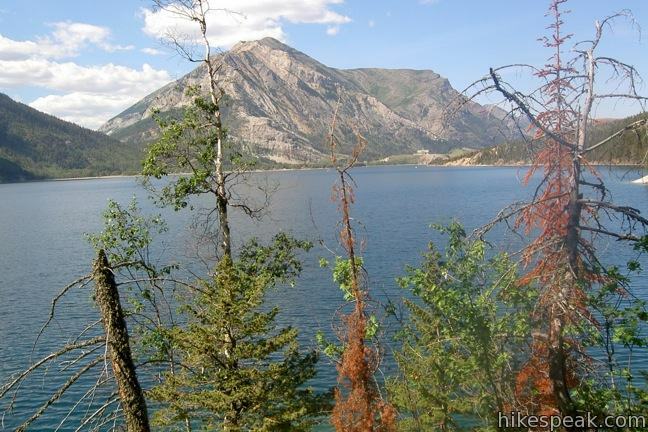 Depending on conditions, it may be possible to hike all the way around the lake for a 30-minute tour. Pines border the north end of the lake, offering shade for picnickers. 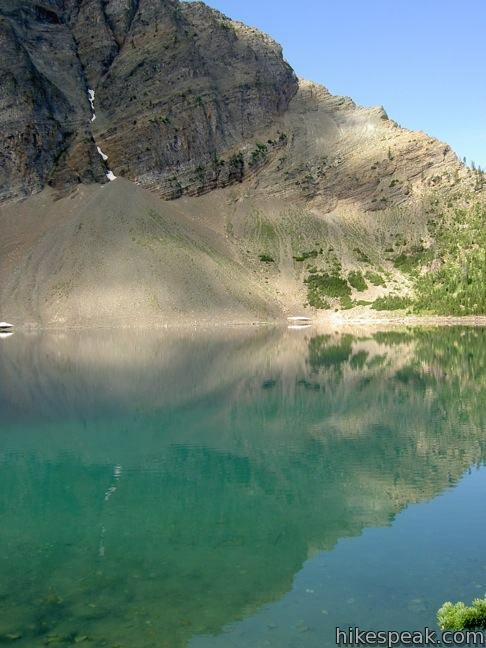 While it is tempting to spend all day at Crypt Lake, it is important to manage your time and reserve a few hours for the hike down to the ferry, which departs at 4:00 p.m. and 5:30 p.m. Don’t be late! On the trek back, turn left at the top of Hell-Roaring Falls Trail to collect new views over a turbulent creek packed with cascades. 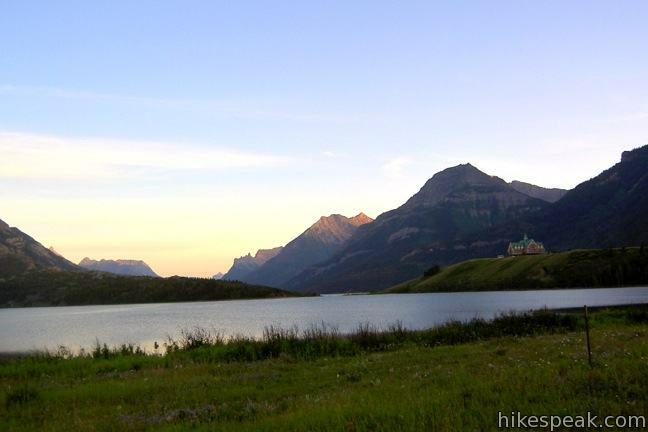 You’ll get a great perspective of Upper Waterton Lake by returning to Crypt Landing via this route. 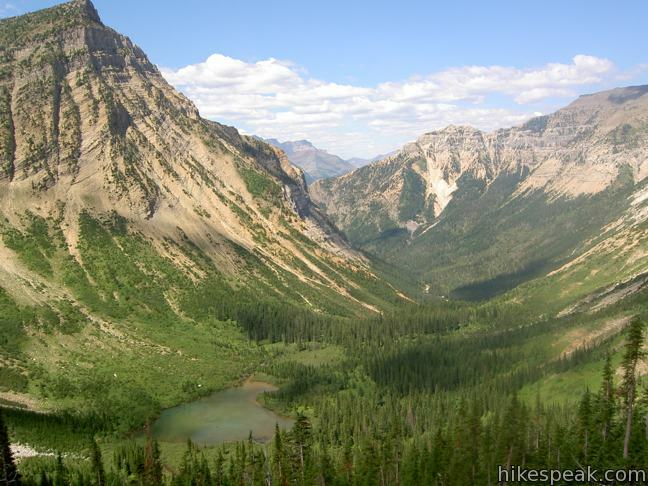 No permit is required to hike Crypt Lake Trail, but there is an entrance fee for Waterton Lakes National Park as well as a charge to board the Crypt Lake Shuttle. Space on the ferry is limited, so plan ahead. 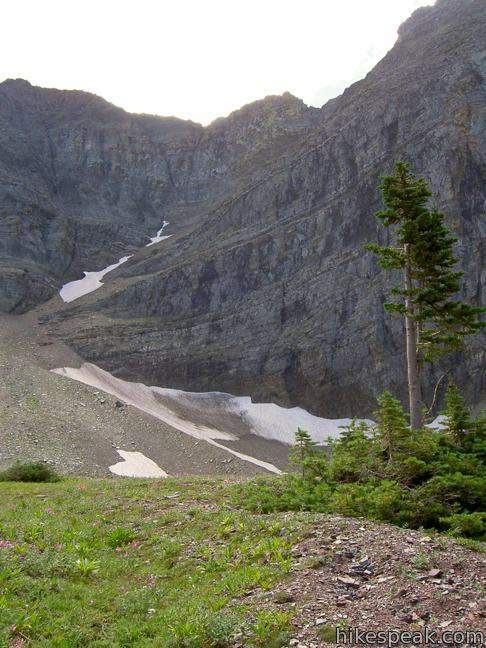 This trail is as exciting and beautiful as they come – guaranteed to leave a lasting impression. 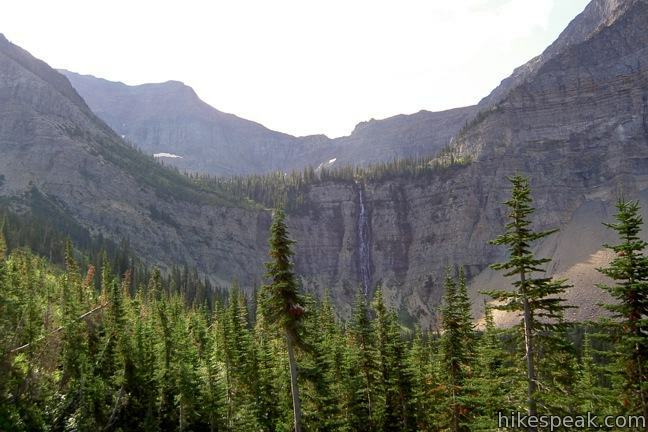 Directions to the marina: Traveling from Glacier National Park in the United States, drive to the town of Saint Mary, Montana on the east end of Going-to-the-Sun Road. Turn north on Route 89. Drive 13 miles and turn left on Route 17, Chief Mountain Highway. 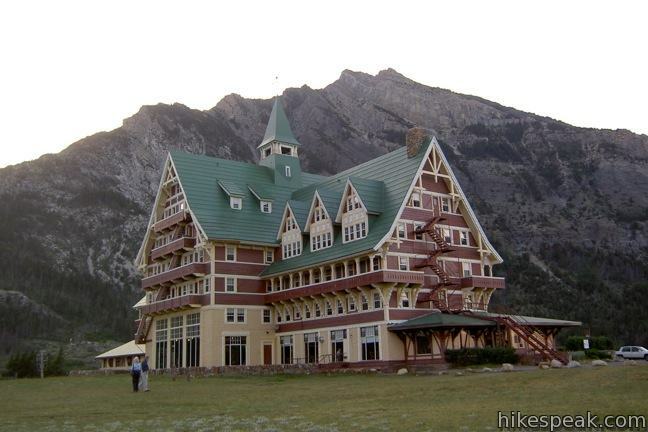 Drive 14.2 miles to the Canadian border where the road becomes Alberta Route 6. Continue 13.7 miles and turn left on Route 5. 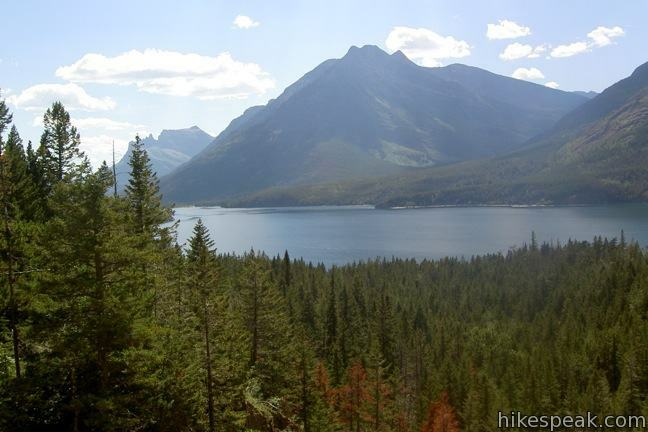 Drive 0.6 miles and make another left to stay on Route 5 west toward Waterton Lakes National Park. After 5.4 miles, turn left on Mountain View Road. Drive a third of a mile to Waterton Avenue and turn left to reach the marina. View Crypt Lake Trail in a larger map. These photos were taken in August of 2004. Click to enlarge. 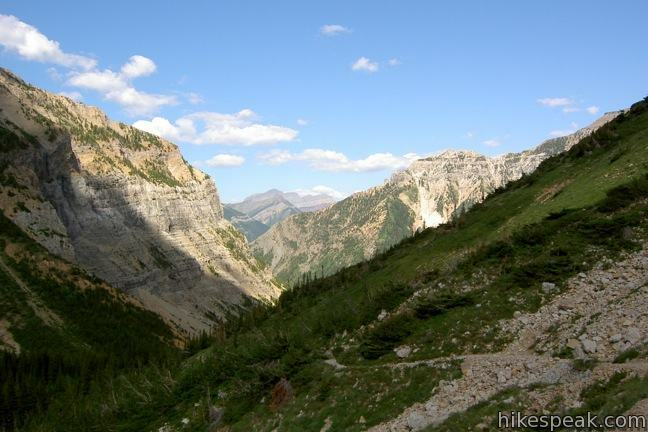 This stunning trail presents hikes of several lengths from 7 miles to 15 miles, like an amazing 13.5-mile through-hike that includes a spur trail to an exceptional Glacier Overlook. 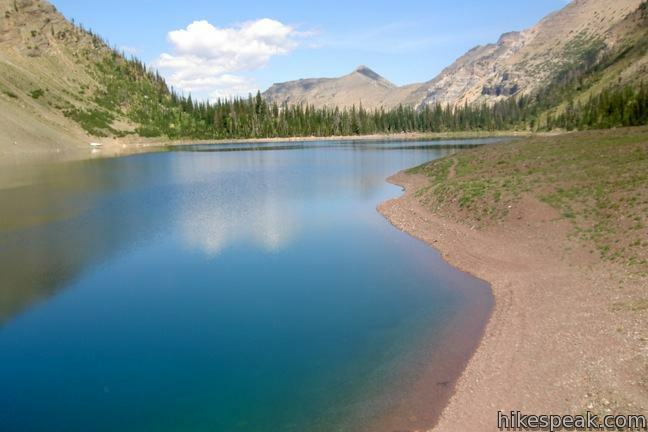 This 2-mile loop visits a small lake in a mossy fores and then follows McDonald Creek past McDonald Falls to return to the trailhead. 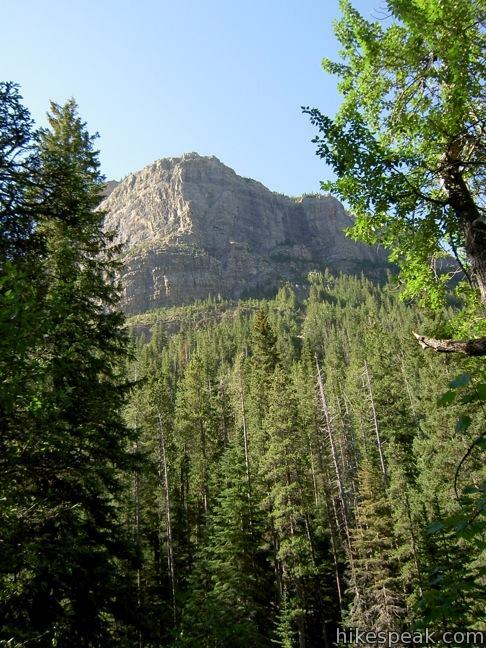 This 3-mile hike visits two waterfalls in the forest above Saint Mary Lake on the park's east side. 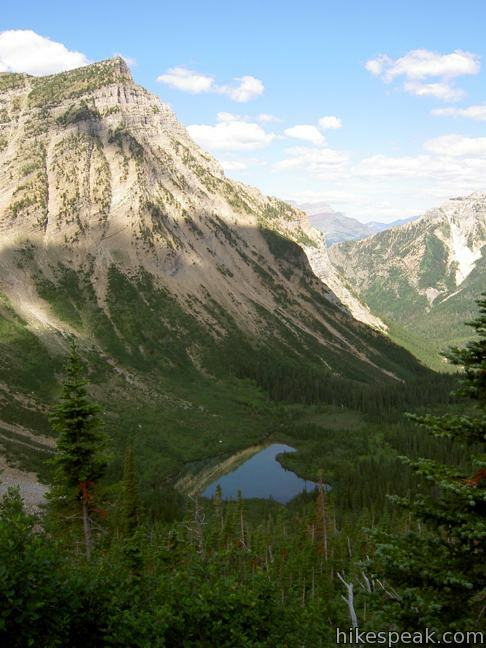 This long but level 7.5-mile hike passes a triplet of beautiful turquoise glacier-fed lakes in the Many Glacier region of the park.